A detailed commentary on this song seems hardly appropriate. 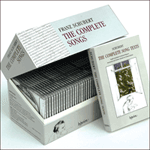 All that exists of the original Schubert is five bars of voice line, written out without accompaniment or text. The heading is ‘Das war ich. Körner’. This is to be found at the back of the autograph for Fragment aus dem Aeschylus, a song written in 1816. (There is thus some confusion about a Deutsch catalogue number for this work: should it be paired with the song’s first setting – thus D174A? – or should it be paired with the Mayrhofer setting as D450A?) We can assume that Schubert was not entirely satisfied with his first setting of the poem in March 1815, at least making a start on a second. We owe the completion of this fragment to the late Reinhard van Hoorickx who here makes a remarkable stab at conjuring an entire Schubert song from this meagre material. 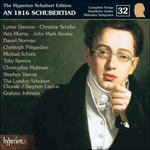 Although writing in Schubert’s style is a dangerous business, we are grateful not to have lost these five hurriedly written bars, music which is so typical of the deceptively simple, open-hearted melodies that Schubert alone was able to write. Even when penning a tune he was never to use, the composer strews such melodic riches in our path that we are charmed, on occasions like this, into relaxing our critical faculties. So hold, so süss, dass es Dir völlig glich. Wie ihr die letzte schwache Kraft entwich. Da blieb Dein liebes, süsses Bild um mich.
so fair, so sweet, that she resembled you. But soon the scene had changed. her frail strength was deserting her. Then a youth rushed to her aid. the new day brought new longing. I saw you blissful in that youth’s arms.